Veteran made natural fire starter that takes a spark very well, burns long, and is water resistant. Fiber Light is a natural finely ground wood fiber and wax fire starter. It is water resistant, takes a spark very well, and burns for a long time. 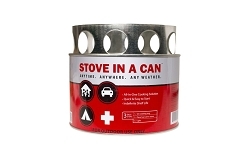 Great natural fire starter that takes a spark very well, burns long, and is water resistant. The 4oz metal tin Fiber Light is packaged in is 3 inches in diameter with a slip on metal lid. A ranger band is used to help seal and waterproof the tin as well. Hand Made by a USMC veteran, in Southern Oregon, Made in the USA.